The only way to survive today’s turbulent marketplace is with the help of engaged and empowered employees. Michael Houlihan and Bonnie Harvey explain how to build an entrepreneurial culture where your employees can truly thrive. Forestville, CA (September 2014)—We all know today’s companies need to be more nimble, more innovative, and more entrepreneurial, and that this shift begins with employees. Don’t we? Yes, we do. By now, so much ink has been spilled on the need for employee engagement and empowerment that our eyes glaze over when (yet another) expert starts in on it. What we don’t know is how to effect the culture change that needs to happen—especially when the organization we lead is already set in its lumbering, bureaucratic ways. Houlihan and Harvey know how to create engaged, empowered employees because they lived it. They started Barefoot Cellars in the laundry room of a rented Sonoma County farmhouse and grew it into America’s #1 wine brand. They were able to do so because of their dedicated employees. Today, they teach corporations how to infuse the principles they lived by into their own cultures, frequently consulting with Fortune 500s and other companies on how to establish and strengthen entrepreneurial company cultures. The Entrepreneurial Culture explains how Houlihan and Harvey kept the spirit of entrepreneurship alive in their company. It wonderfully complements the lessons from The Barefoot Spirit and is every 21st century leader’s guide to infusing their company culture with entrepreneurial thinking. Read on for a selection of tips, excerpted from The Entrepreneurial Culture, on how to create an entrepreneurial culture at your organization. A great way to separate the entrepreneurial thinkers from those who aren’t is to place a special emphasis on hiring people with a sense of urgency; people who can and will move quickly; people who don’t always have to be told what their next step should be. In other words, don’t hire solely based on someone’s technical skill set. You can always teach that. You can’t teach the other stuff—and that other stuff is what will make the difference between an average company and a great company. Here’s an example of how they made performance-based compensation work: If someone sold 100 cases in April 2000, and 100 cases in April 2001 (these numbers are unrealistically small for simplicity), their commission would be the same in both years. But if they sold 10 percent more—110 cases—they would get $1 for every case over that 100, or $10 more. If they sold 20 percent more in April 2001—120 cases—they would get $2 per case for every case over 100. Not just $1 for cases 101-110 and $2 for cases 111-120; they would make $2 for each case over 100, or $40 more. They didn’t just get higher pay for additional growth; they got the boost for all the growth. It kept multiplying. So, 30 percent more—130 cases—would earn $3 times 30 cases, or $90, and on up. “Do you find it difficult to delegate important projects?” asks Houlihan. “Do you refuse to let their work see the light of day until you’ve personally reviewed it, leaving them twiddling their thumbs until they’ve received your feedback? Do you insist on running every new idea through legal before letting an employee pursue it? Are you a micromanager? Here’s the first step to take when it comes to delegation: Start handing over those tasks and projects that your employees can do or can almost do without your input. Trust their expertise and trust that if they really hit a wall, they’ll come to you. Everyone has a unique set of skills, abilities, and talents. Often, your people will have firm—and sometimes surprising!—ideas about what they’d like to take on. Some companies use information as a type of currency—the right juicy piece of info can buy you lunch, help get you a promotion, bring kudos your way, or be traded for other valuable information. The flipside of this, of course, is that in large siloed organizations it’s completely normal for one department or division to have no clue what the others are up to. Always ask yourself, How would I like it? Making gratitude part of your culture plays an essential role in creating employees who feel empowered and engaged. In truth, you should be saying thank you to everyone you come into contact with through your company. Everyone, from employees to colleagues to vendors, will respond positively when you say—or better yet, demonstrate—your thanks. Michael Houlihan and Bonnie Harvey are coauthors of The Entrepreneurial Culture: 23 Ways to Engage and Empower Your People (Footnotes Press, 2014, ISBN: 978-0-9907937-0-0, $9.95, www.TheBarefootSpirit.com) the companion to the New York Times best-selling business book The Barefoot Spirit: How Hardship, Hustle, and Heart Built America’s #1 Wine Brand. The Barefoot Spirit was selected as recommended reading in the CEO Library for CEO Forum and the C-Suite Book Club. It chronicles Barefoot’s journey from its humble beginnings in the laundry room of a rented Sonoma County farmhouse in 1986 to the board room of E&J Gallo, where the brand was successfully sold in 2005. Barefoot is now the largest bottled wine brand in the world. This isn’t about the Life Insurance Market. Or is it? As the U.S. economy improves and adds jobs, younger Americans-millennials-are slowly starting to move out from their parents' basements, where a record number of them have been living for the past few years. They're not buying homes as much as they are renting them, but how much and where is crucial to know in order to understand where the housing recovery is headed. Over the past year, all the growth in net household formations has been among renters, according to the U.S. Census. For those 35 years old and younger, their home ownership rate has fallen from 44 percent to 36 percent over the past decade, which is why construction of multi-family apartments is at the highest level in a quarter-century this year. But back to that migration from the basement. How big is it? Millennials will spend $1.6 trillion on home purchases and $600 billion on rent over the next five years, more per person than any other generation with more of them opting for more affordable rents versus paying the big price tags to buy homes, according to a new report from The Demand Institute, a non-profit think tank operated by The Conference Board and Nielsen. Millennials will form just over eight million new households, albeit most of them rental households. The report found the millennials do aspire to home ownership, just as previous generations did, and they will be important drivers of the housing market. The difference between them and other generations, however, is that their time horizon for home ownership will be shorter, and their aspirations have been altered somewhat simply by the fact that they came of age in the Great Recession. "One important difference between millennials and young adults in previous decades is the unique financial challenges of home ownership today, resulting from graduating into a weak job market with growing student loan debt," said Jeremy Burbank, a vice president at The Demand Institute and Nielsen. "Many millennials are open to alternative approaches to housing finance, including single-family rentals and rent/own hybrid contracts such as lease-to-own." 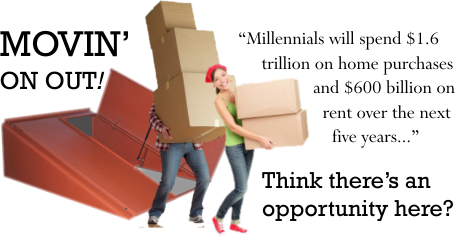 And where will millennials move? The locales are now trickling in. When it comes to big cities, who better to ask than the moving companies? United Van Lines tallied up the results of the busy summer moving season and found that Chicago, Washington, D.C., Atlanta, Boston and Los Angeles led the pack of the most popular moving destinations. Washington also ranked as the No. 1 city that people are leaving, but such is the transient nature of the top political town. While those are the major metropolitan markets, some millennials are looking for mid-size cities with great quality of life. Where should they go? Madison, Wisconsin; Rochester, Minnesota; Arlington, Virginia; Boulder, Colorado, and Palo Alto, California, are the top five most "livable" small to mid-size cities, according to a new report from Livability.com. Researchers there looked at 2,000 cities and their amenities, demographics, economy, education, health care, housing and transportation. Millennials will drive the future of the housing market, and while they may have just started to move out of Mom and Dad's house now, investors should know where they're headed. Published in partnership with CNBC.